Keep your tools sharp and performing at their best. This sharpening stone & whetstone is ideal for pruning shears, secateurs and hedge trimmers, plus can be used for precision grinding debarking irons, axes and bush hooks. It is a two-sided implement with coarse grain on one side and fine grain on the other, suitable for use with both oil and water. 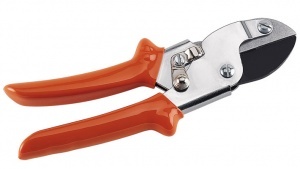 Ideal for work on hard wood, plastic profiles or hoses, these high quality anvil secateurs also benefit from an easily replaceable non-stick blade and an energy-saving pull-to-cut method.